At AlwaysFreshFish.com we purchase our Red Snapper through our worldly contacts. Red Snapper, being a warm water fish can be caught throughout most of the world's warmer open seas. Our imported fish is flown into local airports where our refrigerated trucks pick up the fresh fish. AlwaysFreshFish.com prides itself in purchasing as much domestic Red Snapper as is available through the Southern Atlantic and Gulf States. Fresh Red Snapper is a very popular fish among chefs and is highly sought after. It has a medium firm meat that is sweet and mild. 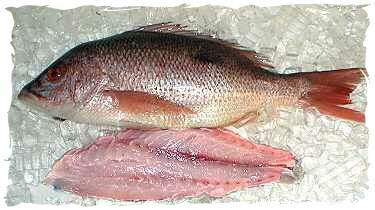 Fresh Red Snapper is generally sold in several forms: Fillets, Whole and Headed and Gutted. Unless otherwise requested we will be offering skinless fillets of Red Snapper. Your Red Snapper fillets will average between 10-20 ounces. 1 lb. Fresh Red Snapper + 4 lbs. Add. Selections = 5 lb. Total Order OK! Rinse Red Snapper fillets under cold water and let drain. Scallions, Honey, ground Ginger, and Dijon Mustard. For additional information on Fresh Red Snapper, please e-mail AlwaysFreshFish.com.